Is anyone out there old enough to remember getting America Online sign-up discs in the mail almost every day? Well…I held on to as many of them as I could, thinking someday I would make something interesting out of them. So here is a lamp that I created a few years ago before I started this blog, so I didn’t think of keeping images of the build itself. It was a pretty simple project. I found a strong circular piece of metal a little smaller than a CD, and drilled 4 holes through it. This was used as a template for the holes and then secured to the top of the lamp once finished. 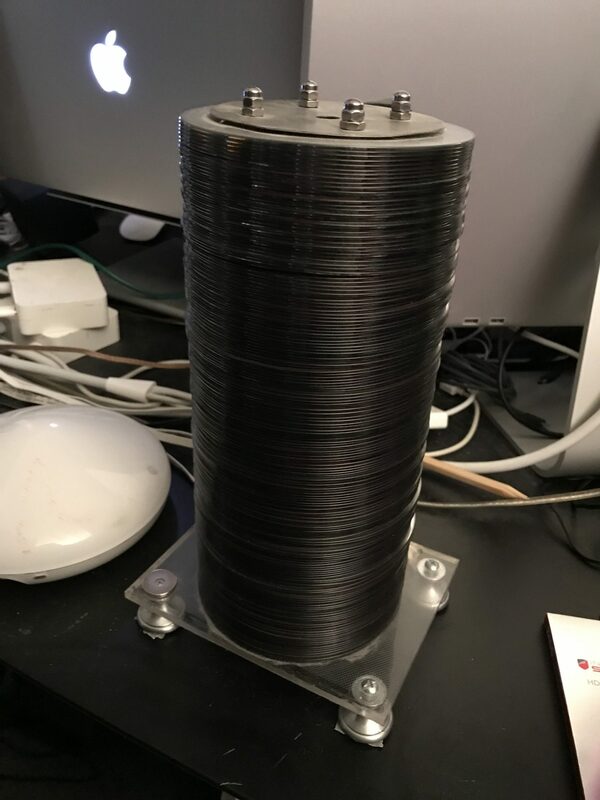 Then I built a wooden frame that would hold a single compact disc in place securely so I could place the metal piece on it and get the holes drilled in exactly the same place on each disc. This was important or the finished lamp wouldn’t look like a nice clean stack of discs. 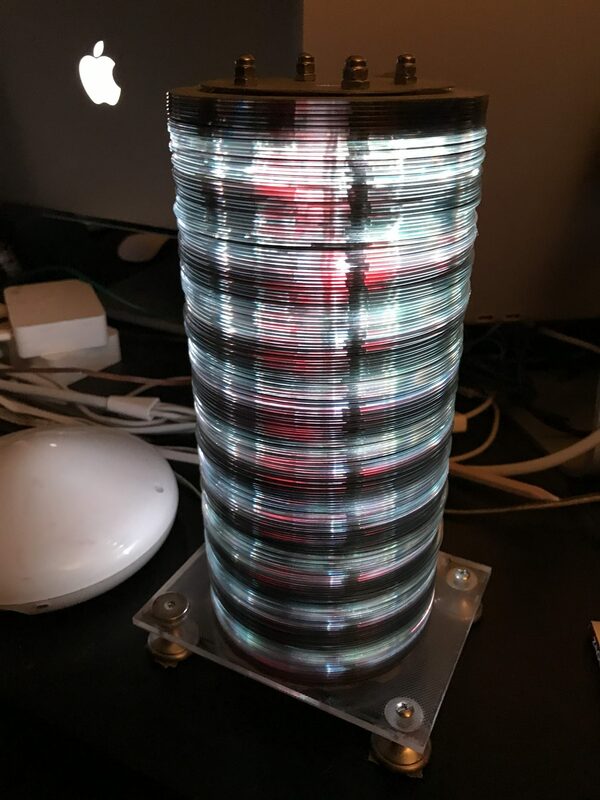 After drilling 4 holes through roughly 250 compact disks…I secured them to a base using 4 long metal screws to keep them from moving, and tightened them down as much as possible. Then it was just a matter of choosing the LED lights. I used the same type of strip lights that you can find at IKEA or online for around $20, the same model that I used for the keyboard lamp posted here. Below are pictures of the lamp off, on, and animating. This entry was posted on Tuesday, March 14th, 2017 at 1:46 pm	and is filed under Uncategorized. You can follow any responses to this entry through the RSS 2.0 feed. You can leave a response, or trackback from your own site.